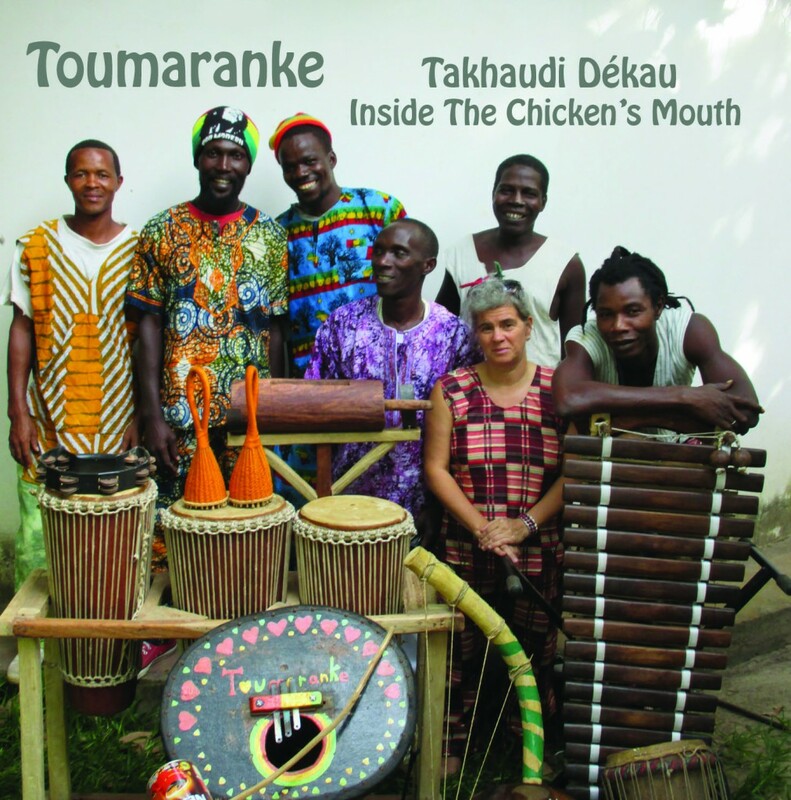 The band I play in and manage, Toumaranke (led by my husband Moussa Sylla) have just released our debut album, Takhaudi Dekau – Inside the Chicken’s Mouth, recorded in The Gambia last year. It’s been an incredible experience, the process of conceptualizing, creating, recording and releasing music always is; but in our case doubly so as we did it all ourselves with the help of lots of friends, some crowdfunding money, and a willing sound engineer. The album is a direct result of the power of determination and co-operation – literally a dream come true. 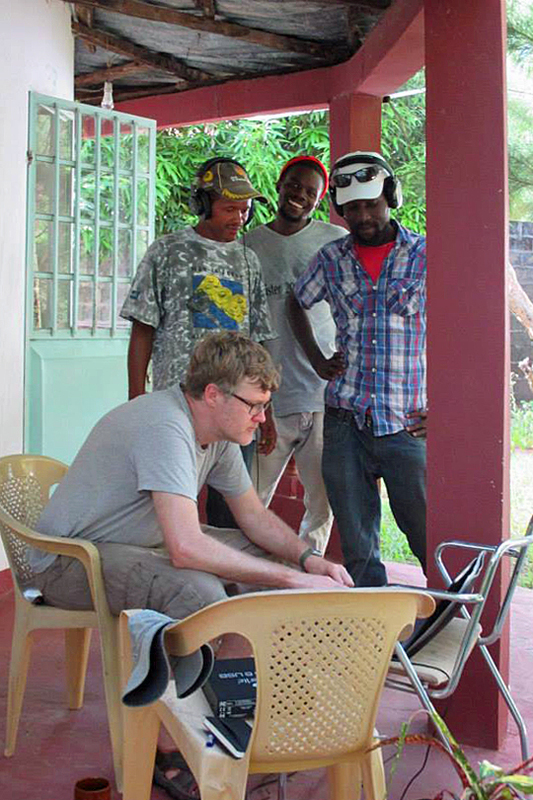 Above: Martin Messent, sound engineer, with Mohammed Okameo Bangoura, musician, carrying his bolon with the blackboard used to indicate recording was in progress. Toumaranke means outsider in Susu (one of the more common Guinean languages). The whole band apart from me are Guinean so are outsiders in the country they currently live and work in, The Gambia. Because I am also an outsider (and very visibly so with my white skin) Toumaranke has been a nickname for me among West African musicians for a long time. 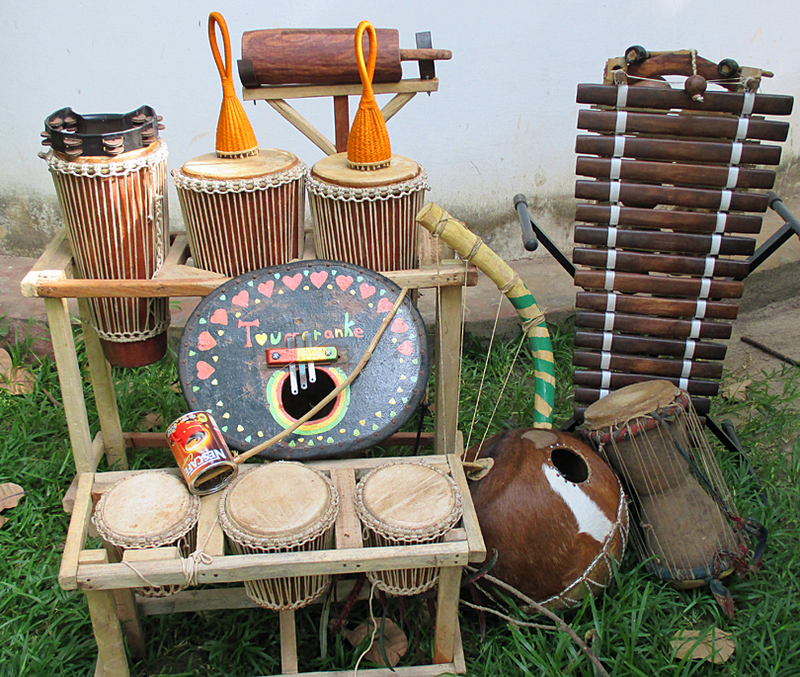 I’ve been studying and playing their traditional music for over ten years and have performed with many groups in hotels, restaurants, bars and at local events such as weddings and naming ceremonies in the Gambia, Cassamance (South Senegal) and Guinea. The core members of Toumaranke, me, Moussa and our friend Mohammed ‘Okameo’ Bangoura, have been working together in The Gambia for many years now. Even though the possibilities for cultural misunderstanding are huge, the uniting power of music gets us through. 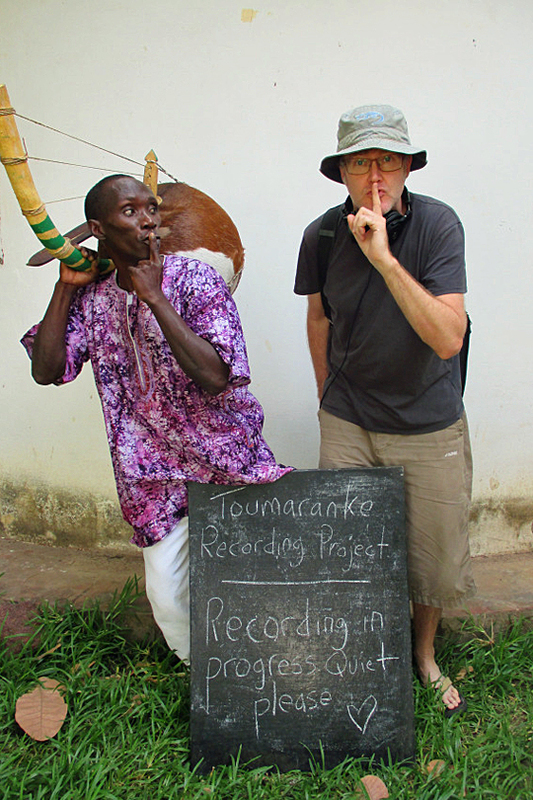 The idea of making an album with Toumaranke came originally from me and an English friend, Martin Messent, who is also a musician, as well as a composer and sound engineer. He’s a guitarist but he’d become very interested in the style of West African music I was playing and teaching. What we wanted to do was record the band ‘live’ with equipment we took to Gambia ourselves, rather than spending large amounts of money on a recording studio. Martin had done the mixing and mastering on an EP I’d made in England with a band I play in, Muso Bango, so I knew the quality of his work. I would do the organizing; he’d help and do all the technical stuff. We’d then bring back what we had recorded so we could mix, master, produce and release the CD in England. 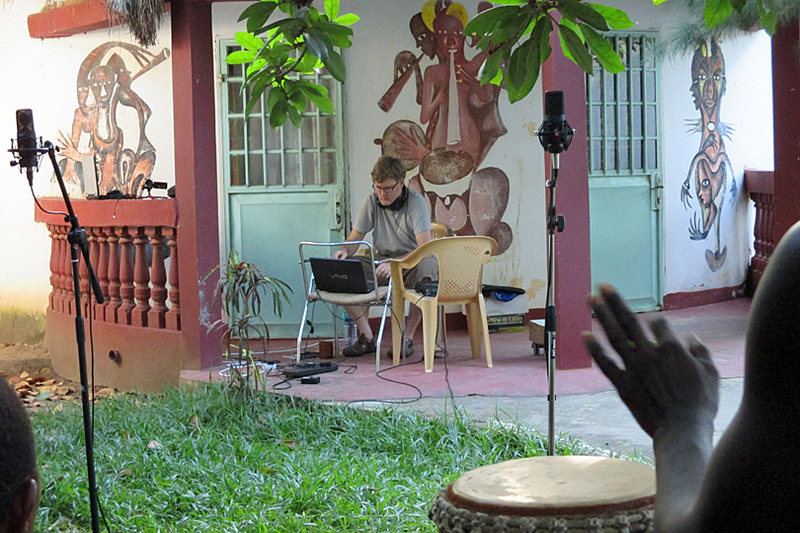 One of the things I do in The Gambia is run music workshops (mostly drumming) so I knew I had the equipment, skills and people to manage a two-week recording residential. The issue was how to fund such a project. The band were keen, they realised the opportunity of making a CD was huge. After much calculation of what we would need Martin and I started a crowdfunding campaign. But raising the money was incredibly hard. Much harder than even I anticipated. In the end more was needed. I looked through my stuff, sold various unwanted things on eBay and did a couple of car boot sales – this all helped but my overdraft also took a serious battering. Above: The house in Sanyang village rented for Toumaranke to practice in before recording our debut album. From left to right Yamoussa (Kossy) Camara, Souleymane Camara, Moese Bangoura, Okameo, Mohammedd Camara (with Moussa Sylla just behind him), Chris Sylla. One of the things that’s difficult for African musicians is their almost total lack of money or commercial possibilities. 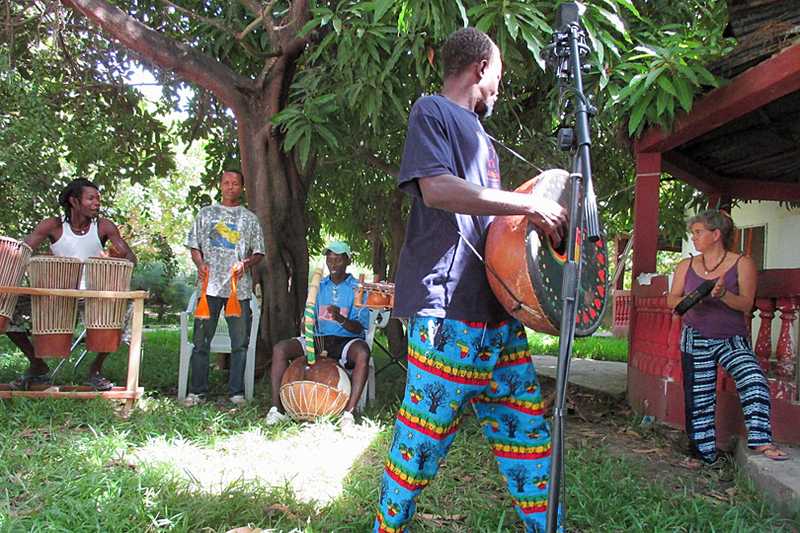 The band incorporates two painters, a guy who works in the building trade and Moussa, who makes all kinds of things from fabric painted T-shirts to musical instruments; but opportunities for work as musicians are scarce. Also due to the totally unforeseen ‘Ebola crisis’ tourist numbers in the Gambia were really low in 2014 (despite there never being a single case of Ebola there). Work opportunities for musicians considerably lessened as hotels weren’t hiring many bands and restaurants were largely empty. We started a small business selling recycled jewelry a couple of years ago called Candora and although it helps a bit it hasn’t provided much income. Over the years I’ve built up a small fleet of bikes for the band, as possibilities are much increased if you’ve got a bike and don’t have to pay transport costs to do things including getting to gigs. People sometimes give me bikes, or I pick them up at car boot sales for £20 or so, and then it’s around £35 to take them on the plane with me. This still generally works out cheaper for a good quality bike than buying one in the Gambia, although I’ve occasionally done that. I’ve also taken two of my grandchildren’s old bikes out with me before to give to the children of friends and this has caused great joy for everyone. Taking another bicycle with me on this trip would mean there was one Martin could use that still had functional brakes. 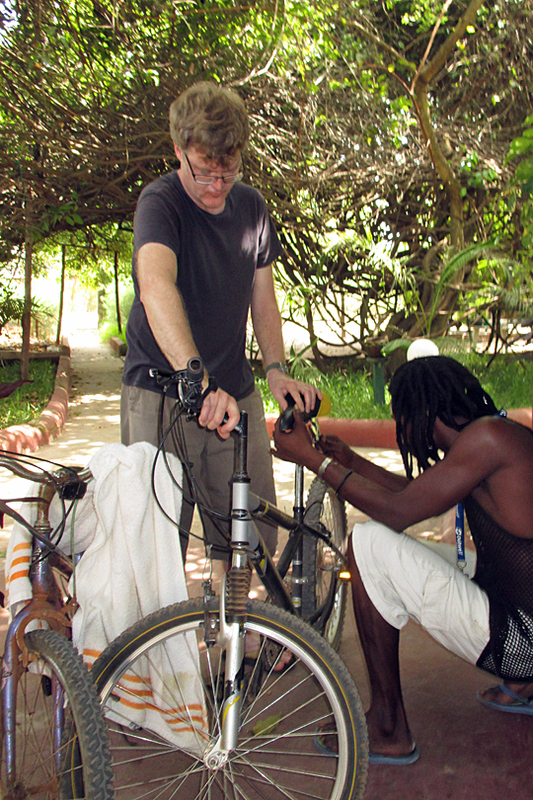 Above: Martin and Moussa adjusting the seat of the new ‘Toumaranke bike’ brought over on the plane by Chris. In November 2014 Martin flew out to join me in The Gambia. It was his first time in the West Africa, his first time out of Europe in fact, so it was very brave and trusting of him to get on a plane knowing nothing much about the country but enough about the geography and culture to understand that finding places on your own wouldn’t be easy. I was pleased that we got to the airport before him so we could greet him as soon as he arrived. 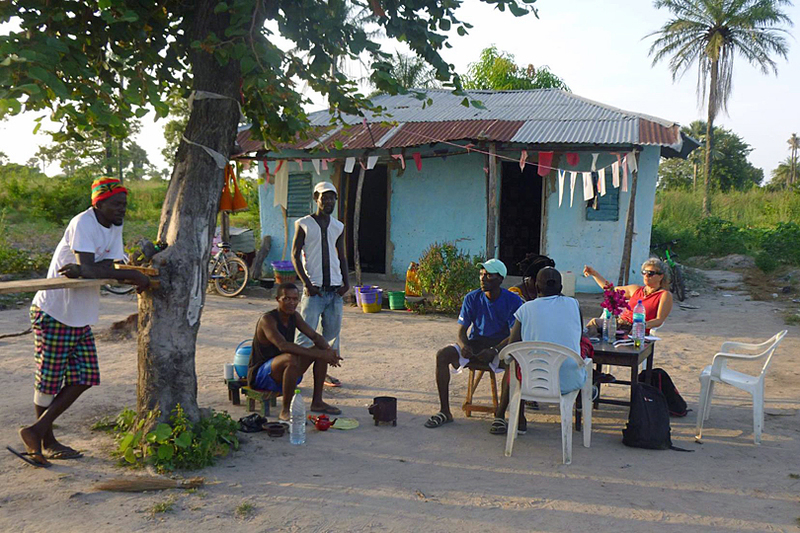 As we drove from the airport through Brikama to our lodgings, for the entire journey, Martin marvelled at how different everything was. And so our two week recording residential began. If you’d like to read a more detailed account of the process, I wrote a blog from the diaries I kept during the two weeks we spent together. It was an extraordinary time for everyone involved. Above: Hadja Daffy preparing a meal for the team. In the background you can just see one of the peanut shell briquette powered stoves Chris purchased for her through The Gambia Experiences’, Community Stove Initiative. 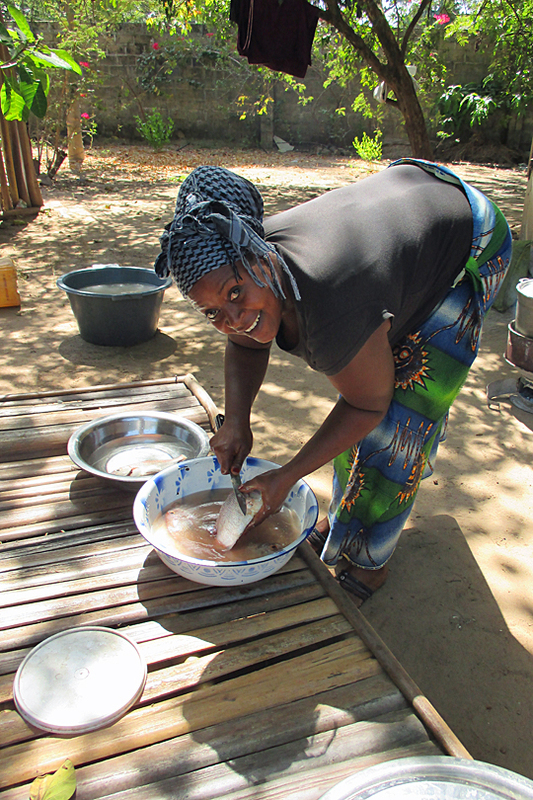 We used our cook, Hadja Daffy, who’s a major star throughout the musical workshops we run in The Gambia. She’s Guinean so she can cook the kind of food the group like best. She also understands vegetarianism, a difficult concept for a lot of West Africans to get to grip with - both Martin and I being veggies. Above: From left to right Moussa Sylla, Souleymane Camara, Okameo Bangoura, Yamoussa (Kossy) Camara and Chris Sylla. We set up an open air ‘studio’ space outside Martins room at the lodge and started work. A rhythm was established – the band arriving around 9-9.30, breakfast together, work till lunch, eat, rest a bit, then record again until about 4. We got down to it and by the second day had some good recording of two of the tracks including our ‘theme song’ Toumaranke. Some mornings there were intense listening sessions – we only had two pairs of headphones and no amp or speakers to play the music through so not everyone could listen at once. Even though the sound quality wasn’t as good, I sometimes put the laptop on the table so everyone could hear what we’d done. One of the extraordinary things about the project was giving the musicians the opportunity to hear their work. This is something we take for granted in the West with so much video and recorded material about and the ease of recording on phones and tablets, but most of the band had no opportunity before to actually sit down and hear what they sounded like. Everyone wanted to look at the video material I was taking too. I was trying to take as much video (and photos) as possible to help with post production profile raising. We were going to have to market and sell a CD by a band almost nobody had heard of, so I was going to need all the media material I could get. Things generally went well with the recording and apart from one ‘day off’, when we all went to the beach with some of the children belonging to friends, we worked solidly for ten days. Our beach day was fun. Football was played and Martin had his work cut out keeping up with the band. By the end of the day everyone had sore feet from running on the hot sand. Some of us went in the sea, primarily me and the kids, but we were joined by most of the band during a break from football. We hung out, we drank attaya, (the ‘gunpowder’ tea so beloved of West Africans). We had a good rest from recording and then returned to work again the next day. The day before Martin left all was finished recording wise so we had a bit of a party. Goat was bought for the non vegetarians and palm wine. Martin had done some extra work mixing three tracks so we could all hear what the finished thing would sound like and we’d borrowed an amp off one of the lodge staff. After dinner and some speeches we listened to what we’d done. Everyone sat in stunned silence. Martin confessed to me later that he was worried they hadn’t liked it but it wasn’t that, it was the extraordinary experience of hearing it all sounding so clear and so professional. We’d done it (well at least the first part of it). Unbelievable! You can listen to some of the tracks on Soundcloud, buy it as a digital download or get it from me in hardcopy for £10 plus £1.20 P&P by contacting me, Chris, at jelimuso1@gmail.com. The music speaks for itself. Enjoy.